Lin Carter, enthralled by the “Dreamland” tales of Lord Dunsany and others, contributed to the growing genre with a series of his own stories, dubbed “The Simrana Tales.” Some of them were published in a variety of small-press magazines and other publications, but they were never collected into a book, and many tales have never been published at all. As Carter himself commented in his afterword to Lord Dunsany’s Beyond the Fields We Know (Ballantine), “The most Dunsanian of my fiction is the Simrana series … the name was coined many years ago and lay in my notebooks awaiting the right kind of story to occur to me.” A complete collection of his Simrana tales could hardly be called complete without including the stories that inspired him to write them in the first place: Lord Dunsany’s masterpieces of fantasy. Thanks to Bob Price, we are proud to be able to bring out, for the first time, the complete Simrana Cycle, accompanied by outstanding stories in the genre including Dunsany’s own “The Sword of Welleran” and others; Henry Kuttner’s 1937 Weird Tales gem “The Jest of Droom-avista,” and new stories by leading authors in the field: Gary Myers, Darrell Schweitzer, Adrian Cole, Charles Garofalo, and Glynn Barrass. Thanks to J. David Spurlock and Barry Klugerman, the book also features a series of six ink drawings by Roy G. Krenkel, originally done for the publication of Carter’s “The Gods of Neol Shendis” in AMRA No. 41. The fantastic tales of Dunsany and his compatriots were snapped up by avid readers of Weird Tales over half a century ago, taking root in the imaginations of authors and artists who continue to craft new myths and tales today. Here’s your invitation to a world of fantasy and fable that is as alluring and thriving today as it was in the heyday of Weird Tales! 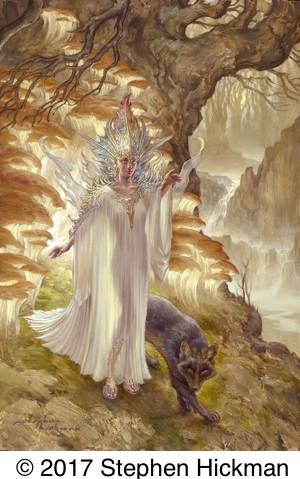 The book features a commissioned cover by Stephen Hickman, master of delicate and colorful fantasies. This entry was posted in Publication on July 8, 2017 by elipsett.